Kung Fu Panda 2 Home Theater Giveaway from Dolby! Congratulations to Jo S. from Novato, CA on winning the Kung Fu Panda 2 giveaway! Combining non-stop action, beautiful storytelling and stunning animation, Kung Fu Panda 2 is a delight for viewers of all ages. Jack Black is back as Po, in his biggest challenge since becoming the Dragon Warrior. Po must lead his friends and fellow kung fu masters, The Furious Five, on a mission of epic proportions to defeat the most threatening rival yet! Today, December 13, Kung Fu Panda 2 is being released on Blu-ray featuring Dolby TrueHD 7.1. Dolby TrueHD delivers enveloping sound that is bit-for-bit identical to the original studio master, unlocking the full entertainment experience on Blu-ray Disc. Be sure to visit Amazon.com and get your copy of Kung Fu Panda 2 on Blu-ray with FREE shipping! And, to take full advantage of the Dolby TrueHD 7.1-channel surround sound featured in Kung Fu Panda 2, Dolby is giving away an Onkyo HT-S5400 7.1 Channel Home Theater system ($599 MSRP) and a Kung Fu Panda 2 poster personally signed by actor James Hong, who plays Po's father Mr. Ping in the movie. Enter through December 20th, 2011 for a chance to win. 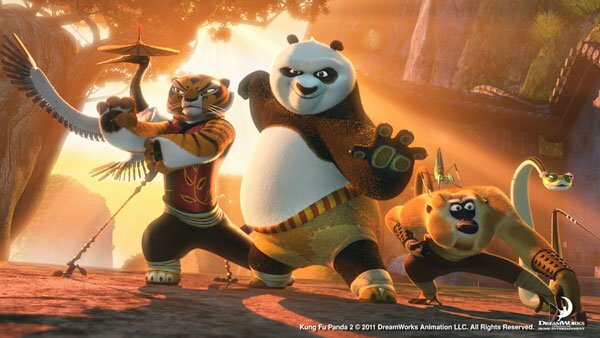 Tell us in a second comment who is your favorite Kung Fu Panda character and you'll get another entry! We will randomly select one (1) winner from the entries. No purchase is necessary to win. The giveaway will end at 11:59pm on December 20th, 2011. Void where prohibited. U.S. residents only. Click here for the full rules. Kung Fu Panda 2 in Blu-Ray with Dolby Surround Sound is the surprise. He has a blue-ray dvd of Kung Fu Panda II for them. Favorite character is his teacher. He has Kung Fu Panda 2 on BluRay. My favorite character is by far, Master Mantis! My favorite character is Mantis. Kung Fu Panda on Blu-Ray and DVD. A Kung Fu Panda 2 DVD in BluRay with him playing Po’s father. Po is my favorite character. I love Po. He teaches so many great lessons! He has Kung Fu Panda 2 on Blu-ray with Dolby sound! The surprise was a Kung Fu Panda 2 on Blu-ray featuring Dolby. My absolute favorite character is definitely Mantis!!!!!! Mr. Hong has Kung Fu Panda 2 in a DVD/Blu-Ray combo pack. I WOULD LOVE TO WIN THIS TO GO WITH MY OLD TV IT WOULD BRING IT TOO LIFE. I LOVE THEM ALL I DONT REALLY HAVE A FAVORITE IT IS HARD TO CHOOSE I LOVE ALL ANIMALS, ID TAKE CARE OF THEM ALL IF I COULD. Kung Fo Panda is the best! Kung Fu Panda 2 on Blu Ray was the surprise for the kids. I’d have to say my favorite character is Po…such a cute and loving panda. The surprise is a Kung Fu Panda 2 Blu-Ray DVD! Po is a favorite. Despite getting knocked down over and over again, he keeps getting up and continues to chase his dream. he has the Kung Fu Panda 2 video for them and he’s my fav. He had the King Fu Panda on BluRay! The dad is my favorite character. Shifu is my favorite that little guy is awesome! and Dustin Hoffman does the voice! His surprise is the Kung Fu Panda 2 blu-ray disc with Dolby TrueHD. My favorite character is Mantis! Gotta love that Seth Rogen laugh! He gave them Kung Fu Panda on Blu Ray! The surprise is that Kung Fu Panda 2 in Blu-ray in now available in Dolby true HD. Po—cause I’m a Jack Black fan! What a nice surprise-Kung Fu Panda 2 DVD on Blu-Ray! His surprise is that Kung Fu Panda 2 is being released on Blu-ray. My favorite character is Mr. Ping. Mr. Hong surprises the children in the video with a gleaming, shiny, new, 7.1-enhanced Blu-Ray/DVD/Digital Copy of Kung Fu Panda 2!